Fountain Pen Inks | Knight's Writing Co. The winter months are upon us and it is with some trepidation that we head into them! Thankfully we appear to have been given a slight reprieve in our first winter of shipping ink - we've been given some mild weather for November and December and January hasn't been so bad either! Each and every shipment goes out from our office packed with the utmost care. As the days get colder, parcels containing ink take a special place in our minds. We check the weather between our offices and your home so we can find the best carrier to send your ink with. It's very much location and temperature dependent. 1. We pack parcels especially careful to make sure ink bottles don't have a chance to shift around or jar during shipping. Ink expands in cold weather so bottles can be more sensitive to shock. 2. 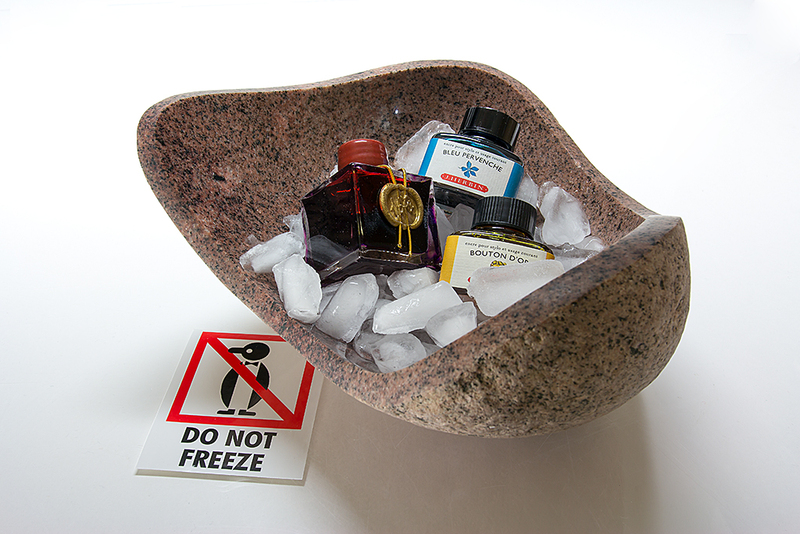 Vessels containing ink (bottles, cartridges, etc) are covered in industrial strength cling wrap to minimize potential leaks and stop spilt ink from ruining any other items in the package. 3. A 'do not freeze' sticky label is placed on your parcel to give a strong hint to the shipper on how to handle your package. 4. Cartridges that come with pens are isolated from the pen and other products in the same way as bottled ink. 5. You may receive a 'pick up card' from the shipper indicating that your package is at their facility and kept in the warm awaiting you to go pick it up. This can be better than leaving it on your door step during the day. But fear not! While it can be difficult for us to re-stock ink during the winter months, we will be bringing it in when we get a break in the weather. And if you find your ink is a little frosty (or even frozen) feel happy with the knowledge that you can still use de-frosted ink without any problems. Your once frozen ink, now thawed is as good as new (this is the official stamp of approval from the chemists)! So keep on writing during the winter months and keep ordering ink when you need it. As we head into spring we hope to stock ink from more manufacturers as well as introduce ink samples and other goodies! I can't wait for spring, but winter is pretty awesome too!